Glass Agencies EROSE are manufacturer of Cream Separator. We are devoted towards offering the qualitative range of Cream Separator, as per client's precise need and requirements. 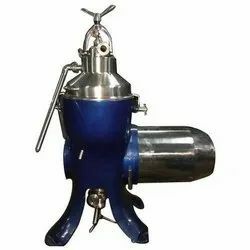 Our Cream Separator's main machine body is made up of heavy duty cast iron and it is fitted with ball bearing, gears excels for smooth trouble free running of the machine. We are the leading manufacturer, exporter and trader of Auto Cleaning Cream Separator. We deal in various types of dairy equipments that are fabricated from best grade of stainless steel and other related alloys. We use only food grade material to fabricate these cream separators to ensure completely hygienic and non-toxic operation. all electrical cream separator capacity 1000 litre per hour (alfa model), all milk contacting parts made of stainless steel. Features: Centrifugal bowl is made of stainless steel AISI 304. Electrically Driven Table Model of motor AC 220 V 50 Hz, Capacity 90 Liter/Hour with Complete Aluminum Bowl, Receiving Tank and Spout Set.